Exploring Digital Citizenship – D'Arcy L. Hutchings, MLIS, Future M.Ed. Prompt: Locate, explore, and discuss 3 theories, models and curricula of/for digital citizenship. I set out to explore what was available in the way of digital citizenship information targeted toward adult learners, as this is my demographic. I wasn’t interested in curriculum for entire courses on the topic (Since we are in one, I know they exist. Here’s another example. ); rather I was interested more in what adults could use for quick self-study or that an instructor might be able to incorporate into an unrelated college course as required or supplemental material. An hour of searching online and in some databases and I discovered surprisingly little. When material is advertised for adults (as opposed to teachers), it seems that it is generally targeting them as parents and telling them how to teach their kids about digital citizenship. (Here’s an example.) Certainly learning how to teach your children would help an adult learn, but this isn’t an ideal way to approach it for my context. If a person doesn’t have children, they wouldn’t think to look at it. Some parts hardly seem relevant to adults (or maybe 30, 50, or 70-year-olds really do need to learn about sexting – what do I know?). The relevance to an adult context is missing as are examples that an adult may be able to relate to in their own lives. Some topics may be relevant to adults may be lacking as well. An adult might be willing to go through the content and think of how it is relevant to them (I think most would just give up) but an instructor wanting to provide a link or 2 as supplemental material in an unrelated class is unlikely to adapt the material to her students or to link to something designed for kids. So what is one to do when the assignment is to explore and compare the things one finds – and one didn’t find? I decided to take a step back and look more generically at what 3 sources consider to be the components of digital citizenship. The idea here is that if there isn’t a great central source for digital citizenship, the next best thing would be to have a list of the components so an instructor could find a great resource for each that is important for her students. 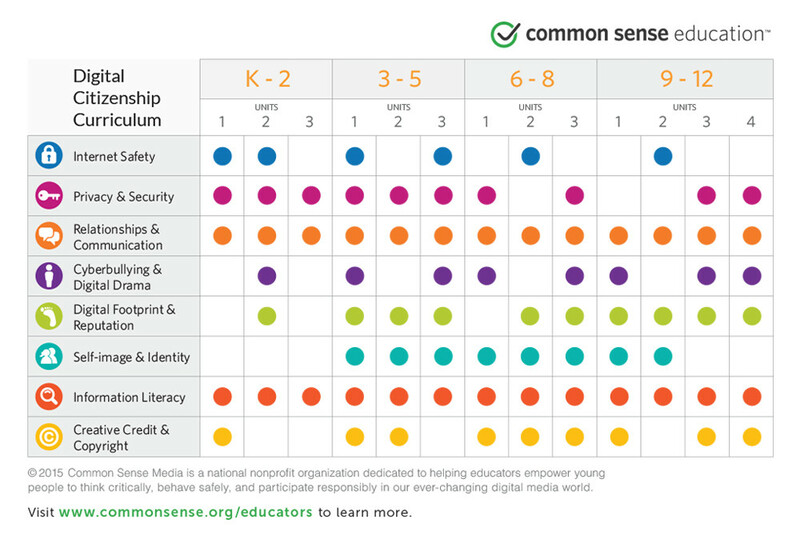 Common Sense Media identifies 8 areas in its K-12 digital citizenship curriculum. Mike Ribble, an apparent thought leader in the field identifies 9 themes or elements of digital citizenship (sorry, no pretty picture here). In order to see where the models overlap, I attempted to fit them into a table. I started with Ribble’s themes because his name and the concept of the 9 themes popped up in a number of sources I looked at. It isn’t a perfect fit because the 3 models have slightly different purposes and approaches but I think it is helpful when trying to think comprehensively. Do you agree with the dots I connected in the table? Did I miss making a link somewhere? There’s plenty of room for differences of opinion and I want to know what you think. Please let me know your thoughts on my conclusions in the comments section below. After spending a lot of time sorting through each model and learning about each component within each to create this table, these are my take-aways. I like that Ribble included expanding digital access as a part of digital citizenship. This reflects a value that I share, that we must recognize the unequal access to technology and the internet and work to improve access in order to level the playing field. Neither of the other models addresses this (the MacMeekin Include is about including people who want to join rather than ensuring equal access). This is an element of being a “good” digital citizen. Ribble’s inclusion of buying and selling online suggests that his model is meant to be holistic and for any age. The other two are geared toward children and teenagers who presumable don’t do much of that. MacMeekin’s approach of breaking it down by activity is refreshing and may be helpful for making application of the concepts clearer to kids. However, I found the number of items overwhelming. Some apparent redundancy and the random nature would be helped by including some grouping of the concepts. Common Sense Media’s approach is very topic-specific (as in topics you would teach). It works for their intended purpose despite there being apparent overlaps. Ribble’s seems the most comprehensive and applicable to all ages. I couldn’t think of anything I would add. Initially, I thought I might collapse some of his points into one but as I started trying to make my own version of his model, I realized that they didn’t overlap quite so much as I was initially thinking. This entry was posted in ED654 Digital Citizenship, Higher Education, ONID and tagged digital_citizenship, digital_literacy, ED654, explore, nousion, ONID by D'Arcy Hutchings. Bookmark the permalink.